The semi-submersible «Nanhai VIII» will soon head to the Leningradskoye field off the coast of Yamal on a drilling mission for Gazprom Neft. The heavy lift vessel «Hai Yang Shi You 278» raised eyebrows among locals as it last week entered the Kola Bay with the «Nanhai VIII» drilling rig on board. It was a powerful sight rarely seen in Murmansk, the Russian Arctic city. With assistance from the state port authority Rosmorport, the rig was successfully unloaded in the waters of the Kola Bay and towed to a nearby anchoring position. This kind of operation has never before been conducted in the Kola Bay, Rosmorport informs. The «Nanhai VIII» is owned China Oilfield Services Limited (COSL) and can operate on water depths up to 1,400 meters. 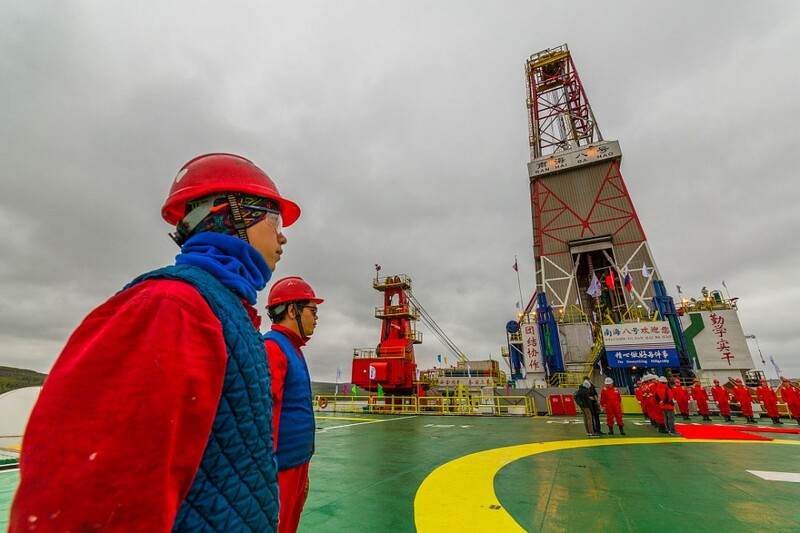 The drilling depths can be 7,600 meters. It will spend an estimated ten days in the Kola Bay before it sets course for the Kara Sea and the Leningradskoye field. During a ceremony on board the rig, Murmansk Governor Marina Kovtun signed a cooperation agreement with Gazprom Geologorazvedka, the drilling company owned by Gazprom. «The fact that we sign such an agreement once again illustrates that the big Russian oil companies see Murmansk Oblast as a perspective support base for their Arctic offshore projects», Governor Kovtun underlined, a press release reads. The Chinese rig is hired by company Gazprom Neft and has on previously occasions been on drilling assignments in the Russian far east. The Leningradskoye field is located west of the Yamal Peninsula and is believed to hold a trillion cubic meters of gas and three million tons of gas condensate. Gazprom Neft in February this year announced a tender on the drilling operation with a cost frame of 1,7 billion rubles (€26,8 million). Possibly, the «Nanhai VIII» could also take part in drilling in the Kruzenshternsky license, an area located to the south of the Leningradskoye. The Kruzenshternsky field holds an estimated 965 billion cubic meters of category C1 gas and is located partly offshore in the Kara Sea, partly on land in the Yamal Peninsula. A part of the field development plan is the building of an artificial island from where production can take place, Gazprom recently informed. Construction of the island will start «in the very near perspective», Deputy Head of Gazprom Geologorazvedka Nail Giniyatullin said. Last drillings in the Kara Sea was in 2014 when Rosneft in partnership with ExxonMobil made a discovery of more than 130 million tons of oil ad the University-1 (Pobeda) structure. A second drilling scheduled for 2015 was halted as a result of USA’s Russian sanction regime.